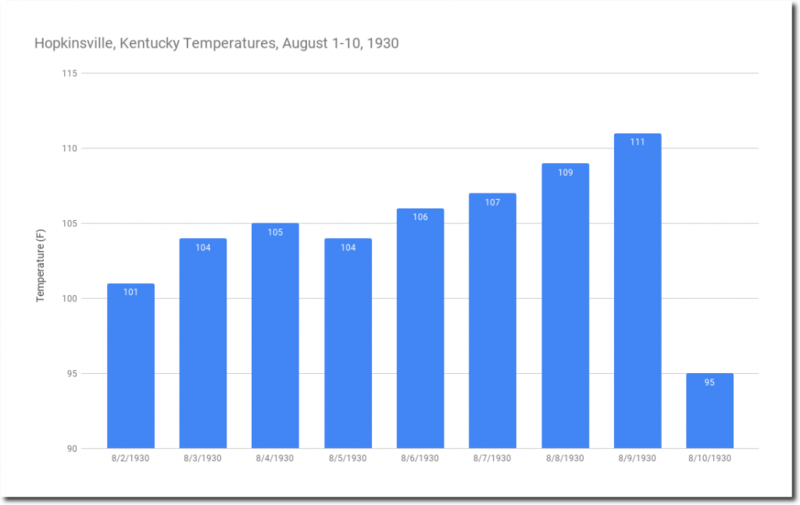 The first ten days of August in 1930 brought an incredible heatwave to the eastern two-thirds of the US. 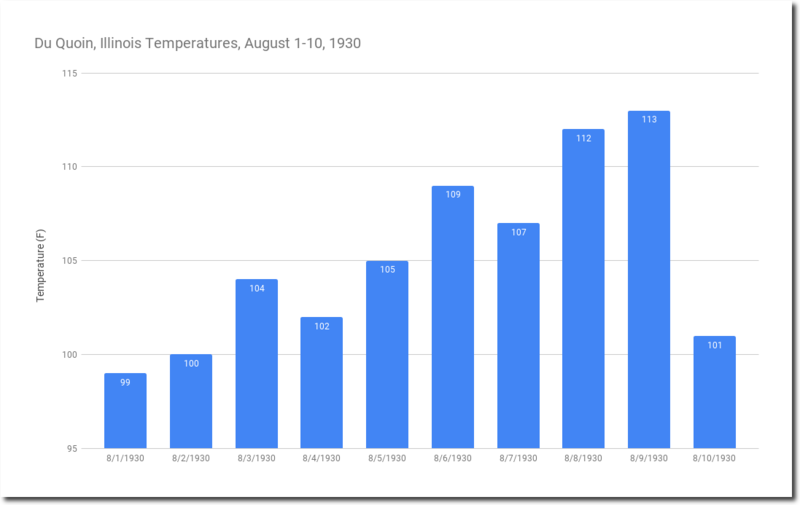 If we had a heatwave like this now, climate scientists would claim 100% certainty it was your fault, say it is only going to get worse, and demand immediate world communism. This “gentleman” explains it succinctly and what a way with words he has. But he hurt the lady’s feelings! How come he didn’t get arrested? It’s hard to say, but it seems like his harsh language helped some people in the audience realize that they were being scammed. The Chicago Tribune seems to be following realclimatescience. They just did a piece on the most recent of their traditional gunfights with charts showing casualties for 2018 against a background of curves recorded in several previous years. Any realization that facts and data matter–especially in subsidized media–is a positive development. 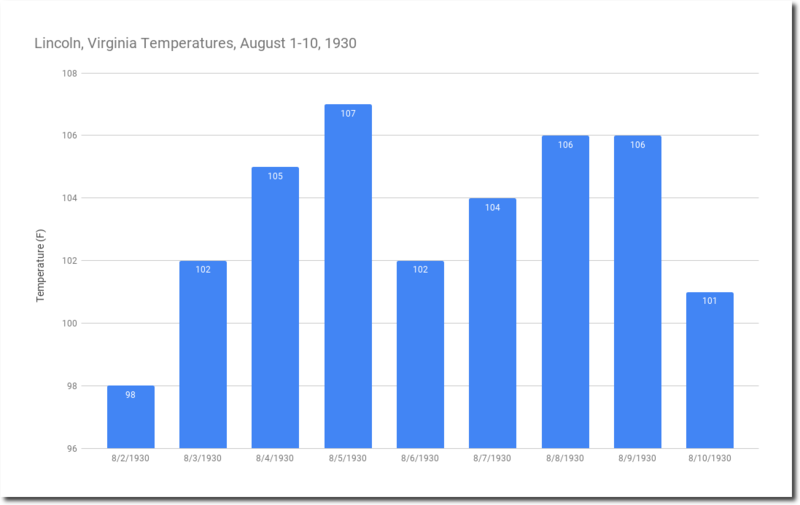 After days of hysterical media warnings about “excess heat” in the DC area, our AGW driven heatwave this current August has consisted of consecutive days at DC Reagan National topping out at 90, 91, 91, 91. Extremely pathetic when compared to nearby Laurel, MD, when consecutive August days, 88 years ago in 1930, registered 98, 100, 104, 99, 97, 102, 103, 98. Laurel in 1930 was a tiny rural village, not the UHI of the highly developed area surrounding Reagan National, including huge amounts of steel and concrete, plus tarmac. Not to mention AC exhaust and jet exhaust. 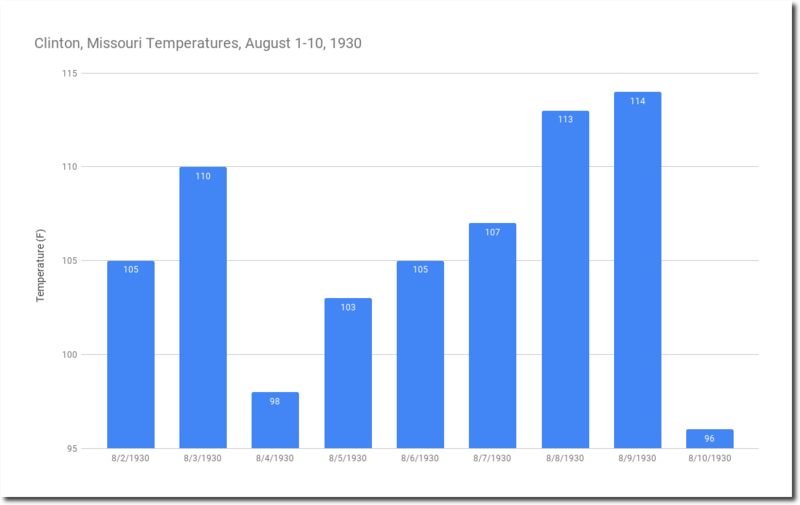 Yet these idiot alarmists insist on cooling the past and warming the present. Junk science at its finest! 90s in DC in August? The tipping point has been reached and the world is coming to an end! So DC is below 90 excluding the airport area. The sky is falling; temperatures above 85 are signs it is your fault. 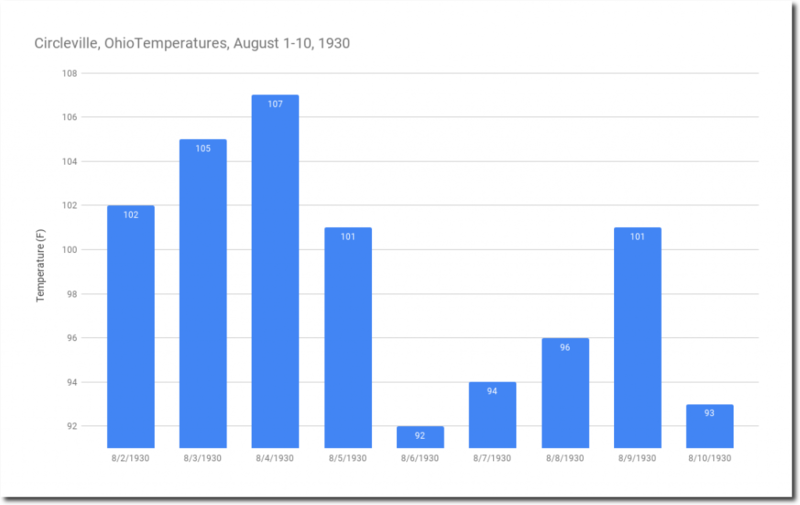 Average high temp for DCA for late July/early August is ~ 88F. So +2 degrees is now evidence of AGW, gimmie-a-break. CNN this week said a hail storm in Colorado was evidence of global warming – you can’t make this stuff up…and people actually believe them?!? 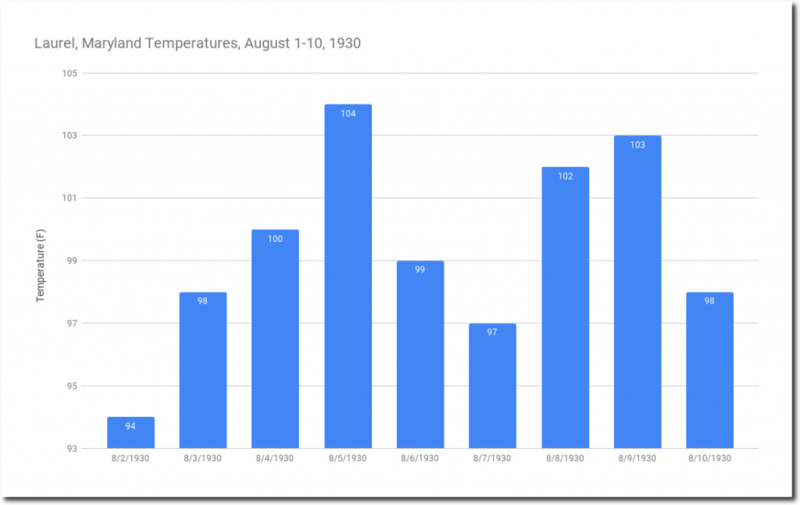 You once did a graph showing how in the early 1900’s the Adirondacks had many days above 100. Is that still available somewhere? I can’t seem to find it in the search. Obviously. Every crisis demands that one man take complete control to stop the bleeding. And then this savior can tell us all how to live thereafter, in order to avoid another such crisis. Makes perfect sense.